I am one of these persons that loves to have my hands busy, whether crafting or cooking it is one of the joys of living for me. I decided to knit a pretty boy blue baby blanket for my pastors baby. I selected the type of yarn, the color combinations. Knitting to me has more movement in it than crocheting. It also makes for a great swaddling blanket, because it has give to it. If you don't know how to knit watch my mini video tutorial on how to cast on stitches , and how to do purl stitch also how to do knit stitch . This pattern is worked in the purl, and knit pattern. Purl the first 12 rows. 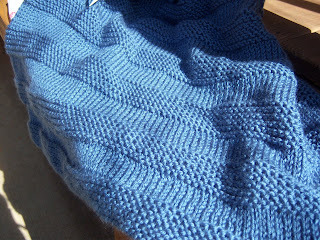 Knit and purl the next 10 next rows to make the stockinette stitch. For picot edging crochet 3 single crochets in the next 3 stitches, on the 3 single crochet chain 3 slip stitch, repeat process all around the blanket. I believe there is an error in the directions for this blanket. In order to get the design shown I purled the first 12 rows and then for the next 10 rows I had to knit 1 row and purl 1 row..repeating these two rows 5 times (total 10 rows). If you just knit and purl you only get 1 row division between the beginning pattern. I hope this helps other knitters because I like the look of this blanket and it is easy to make.